YTHN-42/43-1 OUTDOOR EOC MASTER Brief Introduction: EoC master is the core device of system, which can mix data signal with CATV signal and then transmit the mixed signal to all of subscriber's wall outlets through coaxial cable distribution network, and then separate signal through slave modem and further transfer data signal to subscriber's PC, while video signal will be transferred to TV set. 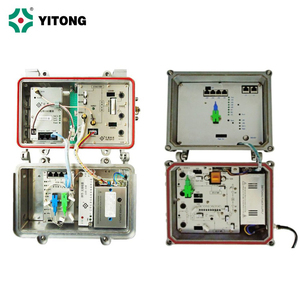 YTHN-42 supports 220Vac power supply, and YTHN-43 supports 60Vac remote powering as well as local powering. Main Features: HomePlug AV Atheros AR7400 Chipset No need to pave new cables as DATA has been directly transferred on coaxial cable Compatible with analog TV, DVB set-top box and IPQAM Single EoC Master can connect as many as 63 subscribers No need new power supply system as it takes remote power Provides power passing function to supply power for next device OFDM modulation, multi-carrier technique ensures stable data transfer under noisy environment Parameters Item Spec. The EOC Master can provide high speed data service. The OR module in the CD7934 can provide an HFC optical input and one RF output. 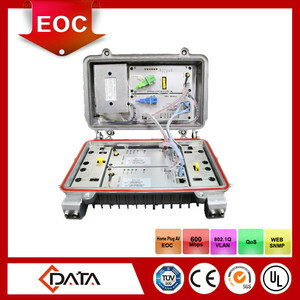 EOC All-In-One (ONU+OR+2*EOC) CD7932-60VAC Built-in one ONU Module, one OR module and two 74 series chipset EOC Modules ; One EPON uplink port, one CATV optical input, two TV+data mixed output port. 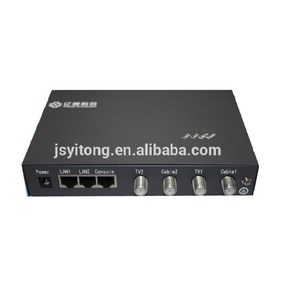 We can use one CD793-WDM-G to instead of three type products, HFC optical node, GPON ONU and EOC master. It can reduce the number of active node in the system, decreasing failure rate and saving a space. The OR module in the CD7934-WDM-G can provide an HFC optical input and one RF output. 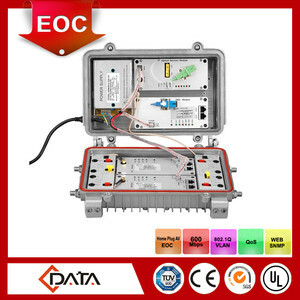 Description Low-frequency modulation EOC series modulate the data baseband( Ethernet ) signals to 5-65MHz band through the way of OFDM, mix the Ethernet signal with TV signal and transmit the mixed signal on the existing coaxial cable in HFC network. 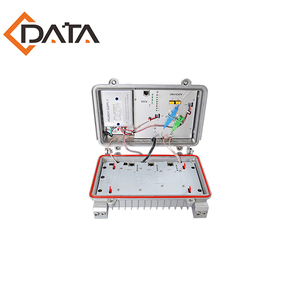 0.254 Frequency Range DATA 5 - 65 MHz TV 87 - 1000 MHz Flatness in Band &plusmn;0.5dB Output Impedance 75&Omega; Transmission Level &ge; 10 5dBuv Return Loss &ge; 1 4dB Insert Loss Single Output Double Outputs Four Outputs &le; 1 . 5dB &le;5dB &le;8dB P ower C onsumption &lt; 1 2W Power Voltage AC 60V/90V/110V/ 2 2 0V (optional) LED Light Power, Link, Data Ports 1 RJ45 port 1 or 2 TV IN ports 1 or 2 CATV+IP outputs Working Temperature -40 ~ +60 &deg;C Storage Temperature -40 ~ +80 Warranty 1 Year Dimension 23.5&times;15.5&times;11 CM Net Weight 2KG Package 8 Units/Carton OEM/ODM available. We offer 24-hour online service to help buyers solving problems. 3). Besides, we use standard export carton or we pack accord- ing to the requirements of our customers. 1. If you test the products and it doesn't work, you can send back to us asap, we will send the replace goods to you with the following order. 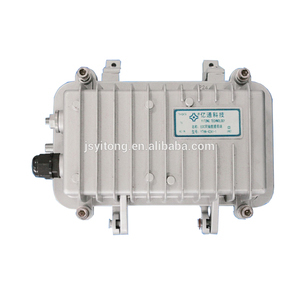 Ningbo Meidu Communication Equipment Co., Ltd. Many product lines, complete varieties, adequate supply, and multiple choices to easily handle mass . Packing & Delivery SHIPPING By express By air By sea Packed with Export Carton,also we can do as your request. 3. Q&#65306; Can I get the samples before order 9 A&#65306;Of course,we are honored to offer you samples ! The strong points of UR52 lie in the multiple encryption tunnels, redundant connection between cellular and Wi-Fi, rich industrial networking protocols, and powerful software inside. Further to this, it features GPS, Wi-Fi, RS232/RS485, Quectel and Telit modules/interfaces for users to build an optimal networking platform for their businesses. With the future in mind, Ursalink designs and delivers customer-tailored products and services with an emphasis on the most minor details that enhance our products longevity. 5. Q: What about delivery time9 A: 1) Samples: within one week. 7. We have been 12 years experience in this field. We are the prefessional supplier that you can trust. Alibaba.com offers 93 all-in-one eoc master cd7934 products. About 8% of these are other telecommunications products, 6% are fiber optic equipment. There are 14 all-in-one eoc master cd7934 suppliers, mainly located in Asia. The top supplying country is China (Mainland), which supply 100% of all-in-one eoc master cd7934 respectively. All-in-one eoc master cd7934 products are most popular in Southeast Asia, Domestic Market, and South America. You can ensure product safety by selecting from certified suppliers, including 14 with ISO9001, 14 with ISO14001 certification.